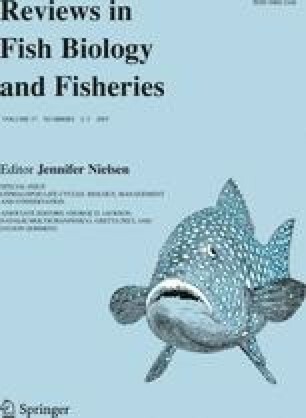 We describe the feeding habits of 70 blue sharks (Prionace glauca) and 39 salmon sharks (Lamna ditropis) caught at 0–7 m depth at night by research drift gillnets in the transition region of the western North Pacific during April–May of 1999 and 2000. Blue sharks of 50–175 cm total length fed on a large variety of prey species, consisting of 24 species of cephalopods and 16 species of fishes. Salmon sharks of 69–157 cm total length fed on a few prey species, consisting of 10 species of cephalopods and one species of fish. Important prey for the blue sharks were large, non-active, gelatinous, meso- to bathypelagic cephalopods (e.g., Chiroteuthis calyx, Haliphron atlanticus, Histioteuthis dofleini and Belonella borealis) and small myctophid fishes. Important prey for the salmon sharks were mid-sized, active, muscular, epi- to mesopelagic squids (e.g. Gonatopsis borealis, Onychoteuthis borealijaponica and Berryteuthis anonychus). Our results suggest that blue sharks feed on cephalopods mainly during the daytime when they descend to deep water. Salmon sharks may feed opportunistically with no apparent diurnal feeding period. Blue sharks and salmon sharks have sympatric distribution in the transition region in spring; they have different feeding habits and strategies that reduce competition for food resources. We are grateful to the captains, officers, crew, and researchers of the research vessels Kaiun-Maru of the Aomori Prefectural Fisheries Experiment Station and Wakatori-Maru of the Sakai Fisheries Senior High School in Tottori Prefecture for their help sampling under severe sea conditions. We also thank Mr. S. Kawahara and N. Baba of the Japanese Fisheries Agency (JFA) for allowing us to examine stomach contents of sharks. Dr. H. Nakano, National Research Institute of the JFA provided information on blue sharks in the North Pacific. We also thank Dr. J. Bower, Hokkaido University, for his proof reading and comments on a draft of this manuscript.